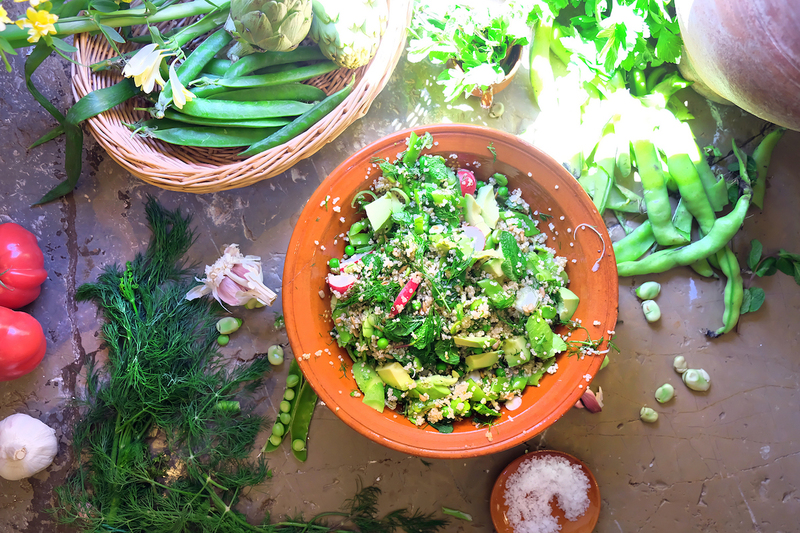 A very healthy looking salad – lunchtime came along today and all we wanted to do was devour and bowl of cheesy pasta but summer is around the corner, bikini bod calling so hey ho no cheesy pasta for us, just a really delicious green quinoa salad. If you have to go green then at least this is an enjoyable one. I am sure we are not alone in saying we have tasted numerous (being kind) of nothing tasting quinoa salads lacking seasoning, dressing, freshness and soul. The poor quinoa. It is very easy to make a really tasty one! First starting with seasonal ingredients so we are in luck.. May brings an abundance of broad beans, peas, asparagus, broccoli, spinach, rocket, samphire, new potatoes, watercress, spring onions and lots of herbs. The happiness that these fresh, crunchy green vegetables bring is a marvel, they go hand in hand with the smell of freshly mown grass and the feeling of that warm golden sun hitting your cheeks for the first time in months. This recipe is a good one, a great all-rounder – of course ticks the boxes of being full of vitamins and minerals and so on and it will feed all your guests (gluten free, dairy free, sugar free) whatever their intolerance might be. But it is an all-rounder in the sense that it goes with anything, any meat or fish, brilliant with the BBQ, fresh on a hot spring day, and comforting on a cold one, great by itself packed into a Tupperware for lunch or served with a poached egg for breakfast. When we serve this dish for breakfast we char slices of haloumi on a hot griddle pan then squeeze over lime juice and sprinkle with chili and coriander, it is terribly good but must be eaten immediately so stay warm and soft, before it turns into funny old squeaky rubber. A delicious springtime, hearty salad that is asking to be tweaked this way and that so add anything that you have in mind, the more fun ingredients the better really. 1. In a pan boil water and cook the quinoa to the packet instructions with salt and pepper. Drain and place in a bowl. 2. Whisk all the dressing ingredients together and pour over the quinoa and combine. 3. Boil water in a little pan and add the peas, simmer for 30 seconds then remove (keeping the water boiling) and refresh in cold water, add to the quinoa bowl. 4. Add the broad beans to the boiling water, cook for 3 minutes, remove from the pan and refresh in cold water. Nip the end of the broad bean and squeeze out of its jacket, add to the quinoa bowl. 5. Add the sugar snaps, radishes, dill, mint, spring onions, and sunflower seeds, and gently mix everything together. 6. At this stage either serve in a pretty bowl and scatter the avocado over if serving as a side salad. Or separate into breakfast bowls and divide the avocado between them, carefully mix.